Just a few steps away from the Old Bridge and Pitti Palace is located The Art Gallery, an unique shop in the heart of Florence where Florentine art of ceramics lives on. 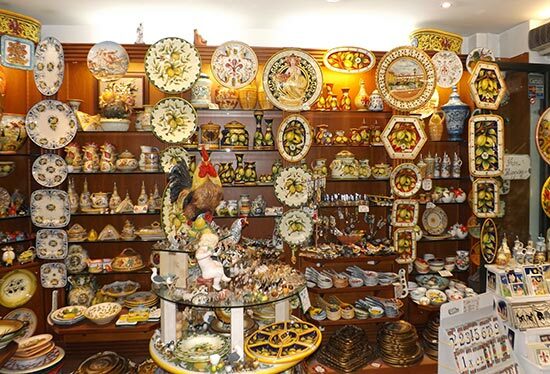 Plates and trays, vases and jars, decorated tiles, cups, animals and much more: at The Art Gallery you can find the most beautiful Florentine ceramics, made exclusively in our factory by Florentine artisans who retained traditional skills and working methods. Hand-painted figures and patterns, shapes and colors of our ceramics reproduce and innovate ancient motives of Tuscan art: each item you see at the Art Gallery is unique and completely hand-made. Learn more about Florentine ceramics in our page Florentine art of Ceramics or enter our Online Shop, where you will find our most popular ceramics as well as recently added items!